@garrett the debate was a bit difficult for me to follow, because I'm not completely fluent in Inuktitut, and all of the candidates chose to respond predominantly in Inuktitut, which is great. I had long visits and talks with all but one of the candidates when they came canvassing. PO as always, visited and chatted, knowing that we have divergent ideas on some issues, and that the legislature failed for the most part, to act on the issue of VAW, which I have been particularly passionate and vocal about. He answered all of my questions and concerns honestly and made no excuses, sticking to his ideals. ES stood out in the debate in that she was very passionate and spoke to her experience in municipal politics. Her visit was much the same, and quite engaging. CR definitely stood out as someone who reflects the real lived lives of Inuit in our riding. She had some interesting ideas, but far less polished than PO and ES. AI was engaging and funny, down to earth and definitely a man of the people. I didn't get a home visit from him, so didn't engage one on one. Really interesting, Pitsiulaaq. Very much looking forward to our first results out of Iqaluit. I'd imagine they will come in a bit later than in some of the smaller communities. I'm going to hop off the live blog for a little bit but I'll be back! See you in a bit Jane! Here's a question for Pitsiulaaq and for our readers - as constituents, would you prefer your MLAs be cabinet ministers or sit as regular MLAs? Or does it matter to you? I disagree that "the consensus is, consensus stays". 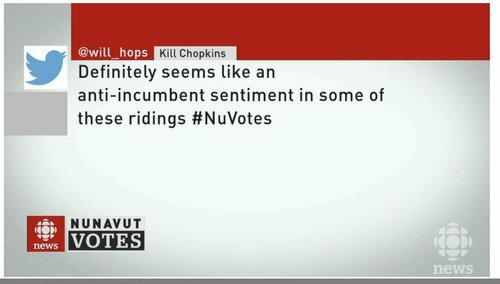 I think CBC should change that line - there is a real debate on whether Nunavut should move towards a party system. @garrett my preference is a regular MLA who reflects the needs of her/his constituents. I think in consensus government that would be my preference as well - that said, I suppose if I feel like my MLA is the best suited for a big job, I'd take that hit for the good of the territory. We have our first winner of the night! Lorne Kusugak has regained his seat in Rankin Inlet South over incumbent Alexander Sammurtok. Kusugak is a former MLA and cabinet minister (was last elected in 2008). Congratulations to Lorne Kusugak on being elected Member of the Legislative Assembly for Rankin Inlet South. Congratulations Lorne and matna Alexander, for your service. Pitsiulaaq, surprised to see such a decisive win? Especially after those same two candidates tied in the last election? @garrett, I'm surprised. I think he was pretty responsive to his constituents. Interesting. I wonder if it's a sign that we're going to see a lot of change tonight. Thanks Tagak - good catch! Editing now. Seeing a few tweets focusing on education as a ballot box issue - Pitsiulaaq, that was a big area of focus for the previous government. How do you think they did? Successes? Things that could have been improved? Important to note for readers - as you see these monster spreads, like Pauloosie Keyootak's big lead, it may be because the poll has come in from just one community in the constituency. Often we see constituencies really rally behind their hometown candidate. We're hearing from Elisapee Sheutiapik's camp that she's won in Iqaluit Sinaa - not yet confirmed by Elections Nunavut, but they sound certain. OK. I'm back. I couldn't stay away! @luc, thanks, I've been seeing patrols on the beach and we really appreciate it. @pitsiulaaq Do you mean Niaqunnguu? In Arviat North-Whale Cove, John Main leading with 1 of 5 polls reporting. Don't want to go too far down the unconfirmed rabbit hole - but would Franco Buscemi winning be a surprise to you guys? He was facing a high profile incumbent and a contender who took her to the wire in the last election. That race is anyone's to win. Very close race. I'm waiting to hear more results confirmed by Elections Nunavut. Also, we have 2 polls in in the crowded 9-person Quttiktuq field, and David Akeeagok has a massive lead. He's the only candidate from Grise Fiord, which makes me think those are the polls that are in (and if being from the same 2 communities is going to ultimately doom the other contenders). If he wasn't my hero already, Kowisa Arlooktoo being on top of the results in both English and Inuktitut is def hero status. In Quttiktuq, it's often a candidate from Arctic Bay who wins. But I've heard David Akeeagok campaigned in all 3 communities in that constituency.